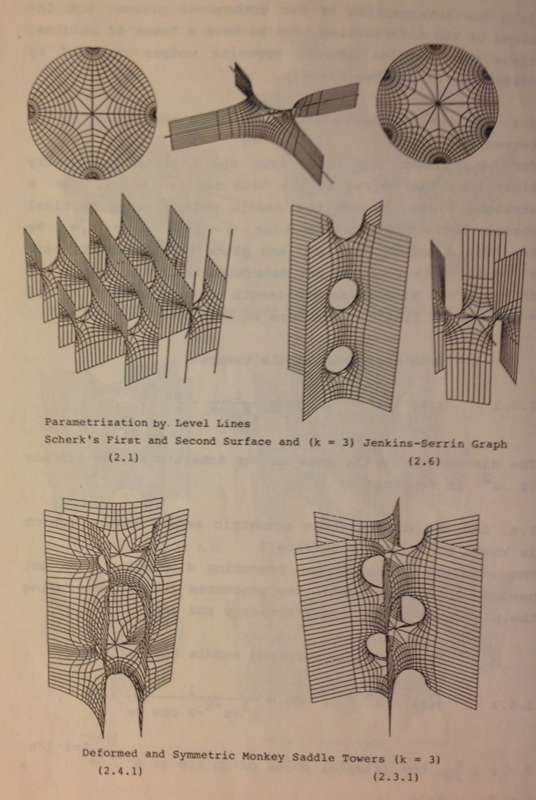 These two surfaces turned out to be fundamental examples when in the 1980s a wealth of unexpected minimal surfaces were found. 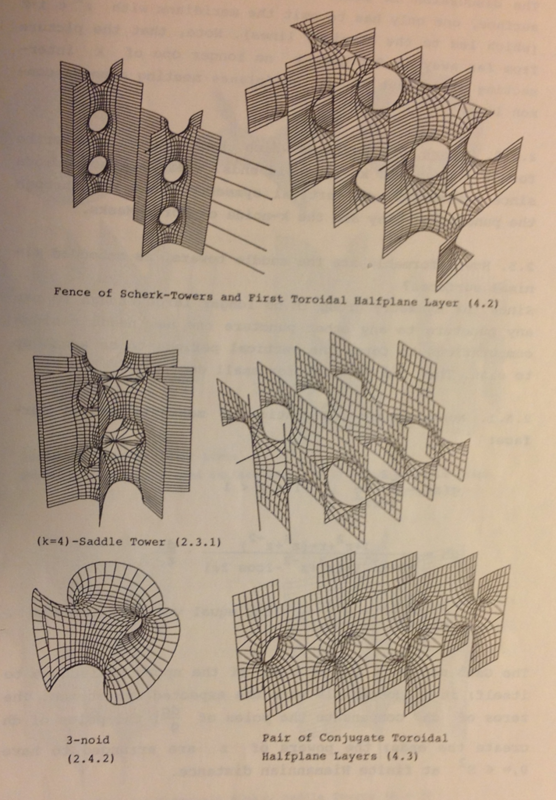 These modern surfaces are all made with the Weierstrass representation - which leaves Scherk's discoveries as a singular success, since no methods were found to write down functions whose graphs are minimal surfaces nor functions which have one minimal level. 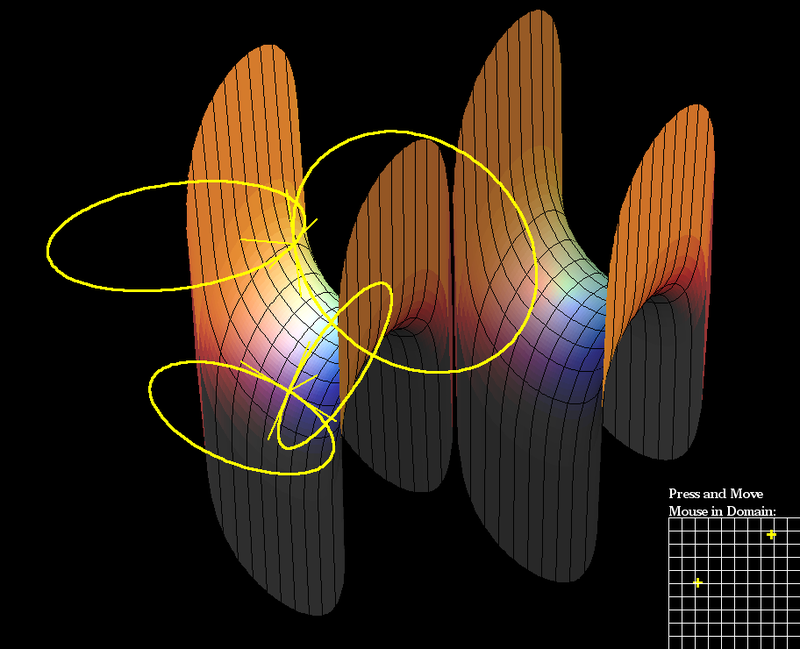 Scherk's doubly periodic minimal surface in the historic graph representation. 5 fundamental pieces for the translational symmetries are shown. The surface extends to infinitely many such fundamental pieces over the black squares of an infinite checkerboard. The surface contains vertical lines over the vertices of this checkerboard, these lines are missing because a graph representation cannot contain vertical lines. To see the checkerboard symmetries we had to use a downward view of the surface. This downward perspective distorts the vertical dimension of the surface. Our horizontally placed fundamental piece shows its true shape. This cross-eyed stereo view is intended to show that the surface is only rotated and definitely not stretched while the fundamental piece turns from vertical to horizontal. The graph of a function f(x,y) is also the solution of the implicit equation F(x,y,z) := f(x,y) - z = 0 . 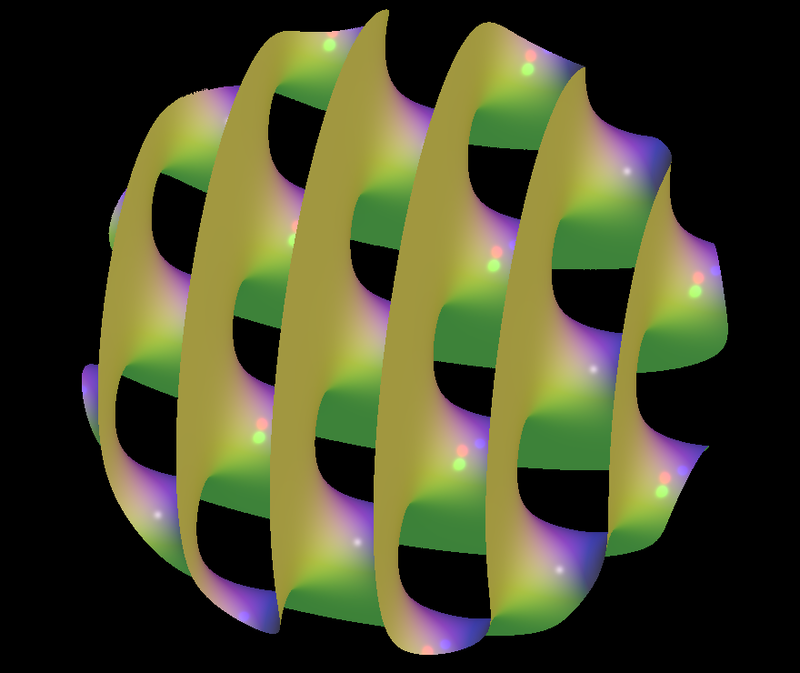 We can therefore compute raytraced images of Scherk's doubly periodic surface, here the part in a ball of radius 10. 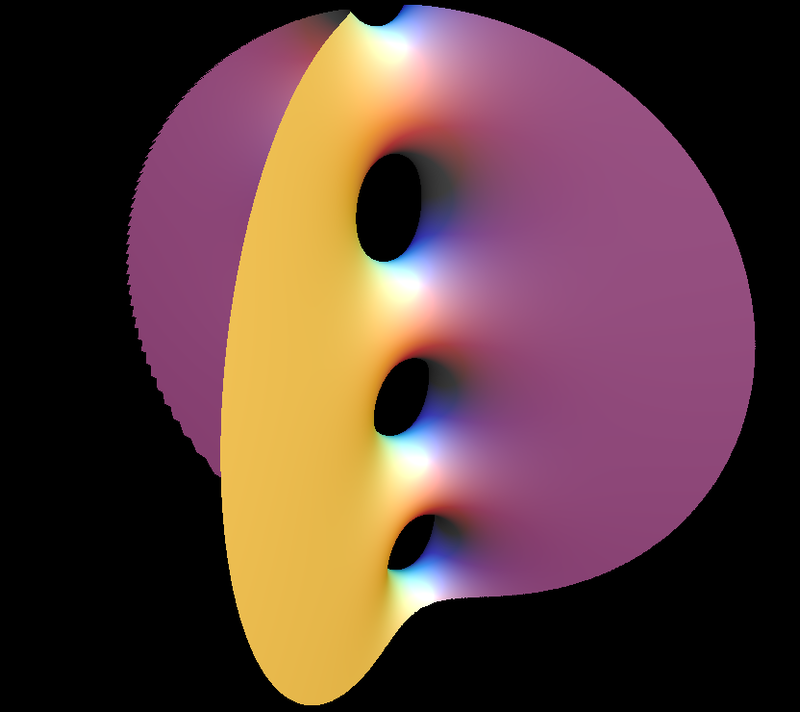 Scherk's singly periodic minimal surface is conjugate to Scherk's doubly periodic surface. This image shows the portion in a sphere of radius 4.5. 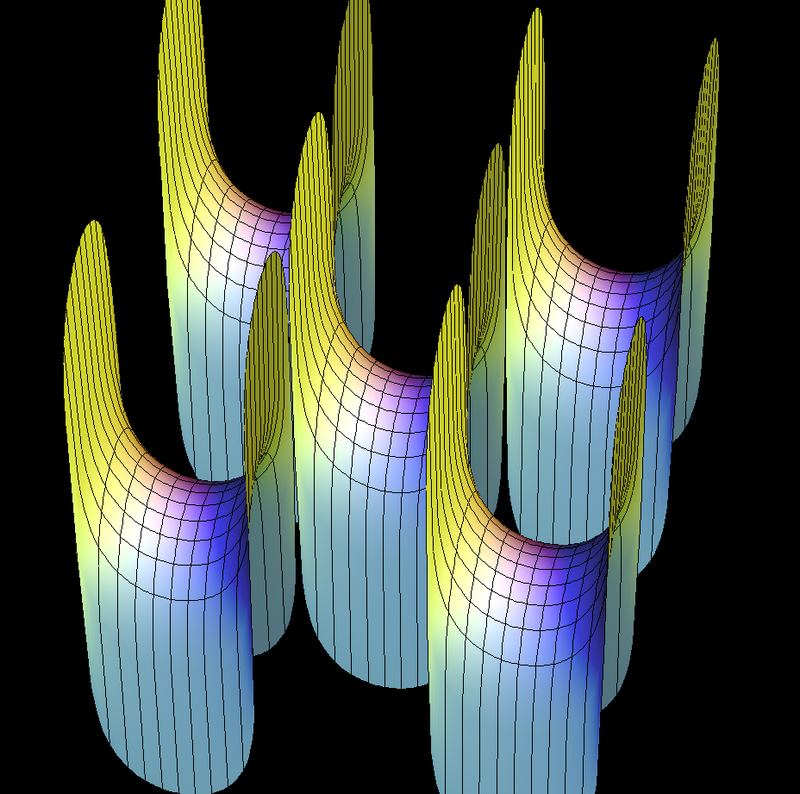 It can be described by the implicit equation sin(z) - sinh(x)*sinh(y) = 0 see Saddle Tower for generalizations and renderings made with the Weierstrass representation. We are not aware of images from the 19th century. Our rendering raytraces the solution of the implicit equation. 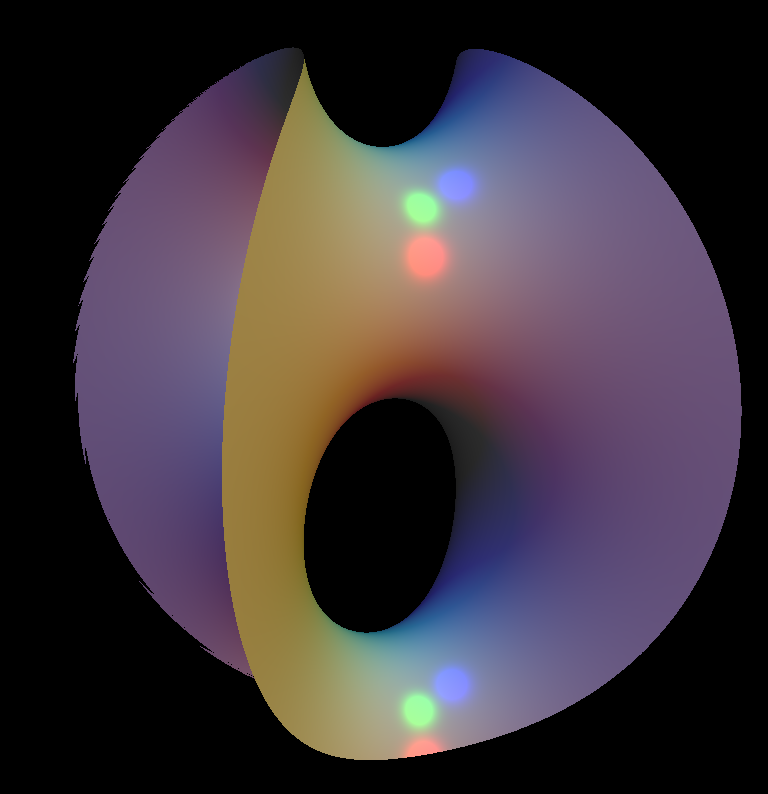 A raytraced image of Scherk's singly periodic surface in a ball of radius 10.